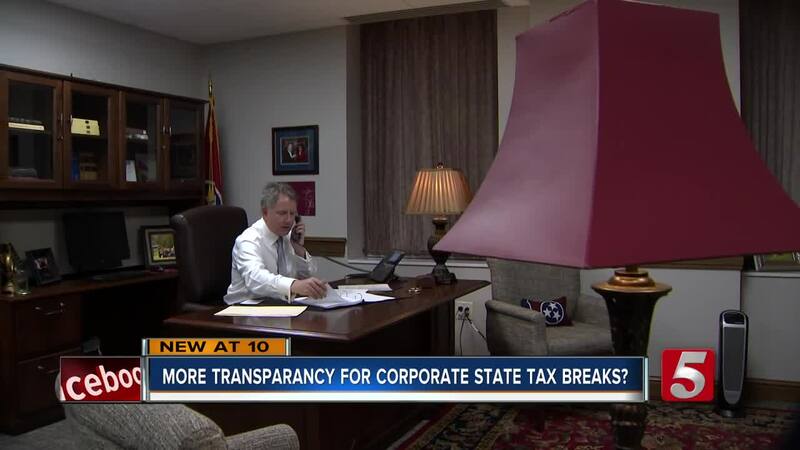 A bill would no longer keep tax breaks for businesses secret and would also require businesses pay back the money if they don't hire as many people as they said they would. NASHVILLE, Tenn. (WTVF) — It's money that could go to your child's school, or toward re-paving your route to work! But instead, the state cuts big businesses a tax break, in hopes of bringing hundreds of jobs to Tennessee. Right now, state law keeps the specifics of those deals a secret. But that may soon change under a new state bill proposed by Sen. Kerry Roberts (R-Springfield). His bill would also require businesses pay back the money if they don't hire as many people as they said they would. "If somebody doesn't perform, if they don't do what they say they would do, they ought to reimburse the state of Tennessee -- its not fair to the taxpayers," Roberts said. But not everyone agrees with the proposal - the Tennessee Chamber of Commerce and Industry has said it worries the change may make Tennessee a less business-friendly state.